The Star Wars Kinect game, which so enthralled us before so quickly disappointing us when first revealed earlier this year, has around twelve months to get things right, with a release pencilled in for late 2011. 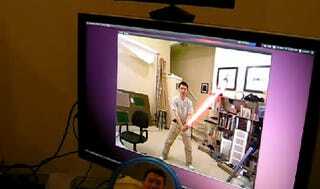 "We have a Kinect Star Wars game coming out for next holiday", Kinect's creative director, Kudo Tsunoda, told the BBC. "I think you could just easily imagine being a Jedi and using Kinect to make you feel you're part of a Star Wars experience, building yourself up into a Jedi." They're going to have to add a little more than arm-waving over the next twelve months if they actually want this thing to feel like a Star Wars experience.